Our Overwatch Baptiste guide contains ability and strategy tips, and everything else you need to know about mastering the combat medic. Overwatch's 30th Hero - Baptiste - will be added to the game in just a matter of hours from now, and after a lot of time spent messing around with the new Support on the PTR we can't wait to take him into the battle proper. This Support doesn't just bring something new to the table in terms of healing and defense, he's also got some pretty nifty offensive tools as well. He's a proper all-rounder, and we suspect Baptiste is going to be a huge part of the meta going forwards. For that reason, you want to make sure you have a thorough grounding in how Baptiste actually plays, regardless of whether you intend to add him to your own roster of characters or not. We've put together a guide that goes into depth on all of his abilities, with tips to help you play him to perfection - and know what to expect from the other team if they're packing Baptiste! Baptiste's primary fire mode is called the Medic SMG. This is a midrange sub-machine gun that fires in three-round bursts. The developers describe this as a very fun weapon that really fits the character. You'll be able to fire off approximately 45 rounds before reloading, which means a maximum of 15 bursts between topping up. The Medic SMG also has an extremely powerful secondary fire. Called the Biotic Launcher, firing with the right mouse button chucks out a healing grenade instead. You can fire 10 of these healing shots before having to pause to reload. To be absolutely clear, when you reload in either of these firing modes both will be topped up at the same time. When the grenade lands, it dishes out splash healing within a certain radius. If your team is grouped up, or if you have someone in need of healing below you, you can fire the grenade down and heal everyone that's within its radius of effect. Keep in mind that the healing grenades you fire cannot heal you personally, so just focus on your teammates' survival when flinging these around. If you need help yourself, you need to rely on another team member or your Regenerative Burst ability. Try to fire your grenades in such a way that you gain maximum benefit from them. That means targeting it where your teammates are clustered, and ideally from height so you have an optimal view of where to fire. This provides a point-blank heal over time. When you activate it, everyone within a certain radius of Baptiste is healed, as is Baptiste himself. It takes time for everyone's health to get topped up, and it's also a crucial source of self-healing too, as Baptiste cannot be healed by the grenades thrown with his weapon's secondary fire. Note that there is a 15 second cooldown on using this ability, and it restores 150 health points across the duration of its effect. Regenerative Burst is Baptiste's critical self-heal ability, but keep in mind that it heals over time. That means if you're really in a pinch then you're going to need the help of another support on the team. It takes practise and experience but make sure you maximise the group healing potential of Regenerative Burst. Position yourself such that the maximum number of allies are caught in its effect, but keep in mind it'll take other players a little bit of time to acclimatise to the range of this new ability too. When this is activated, Baptiste will throw a device which sticks to the ground and then creates a big cyclinder that has high visibility for Baptiste, his teammates and the enemy too. Any friendly player who sits within the protection of this field cannot be damaged below a certain health threshold, and that floor is very low. You'll be able to see this threshold clearly in the health bar UI. Keep in mind that enemy players can actually destroy the Immortality Field by firing at the generator that sits in the middle of it. Once destroyed, the defensive benefits disappear, so be ready to get everyone topped up with health if the Field is being chipped away. It can be a good idea to drop the Immortality Field behind a shield provided by characters like Reinhardt or Orisa. This will make it harder for the other team to destroy the Field, and extend its period of usefulness. The Immortality Field is also excellent for dealing with ultimate like Junkrat's RIP-Tire. The Immortality Field will essential nullify its potential to wipe the team out, and it should lead to some extremely exciting moments in competitive play. Don't idly throw away the potential team-saving effect of Immortality Field. It's best reserved for a powerful ult combo play made by the other team if you think one is close to dropping. Think the agony of Zarya with either Hanzo or D.Va. If the enemy team has set up really problematic sniping positions, you can drop the Field in a position that allows the rest of the team to peak around and pick off the problem. Just remember to keep that healing coming while they're busy taking out the trash. You can tell if your teammates are experiencing the projection of the Immortality Field by looking at the new bar that appears at the end of their individual health bars. If you study Baptiste's artwork carefully you'll see that he actually has an exoskeleton. If you hold the Shift button down, you'll be able to charge up a jump. The longer you keep Shift held down, the bigger the jump will be, although it does have a maximum limit! This extra ability has been included to ensure that, as a support character, Baptiste has a way of disengaging with the enemy. Because of the healing grenade's splash damage, it also means that Baptiste has a way of reaching height quickly and then raining heals down onto his team below. Use Exo Boots to gain an aerial advantage on the battlefield and direct your healing efficiently. Don't forget that you can also use your Exo Boots to reach long-range enemy heroes and take them out with your own not-inconsiderable firepower. Once fully charged, you can release crouch and move - slowly - before activating your leap by hitting the spacebar. Baptiste's ultimate ability is called the Amplification Matrix, and functionally it works in much the same way as Mei's Ice Wall does. You'll see an outline of the Matrix before it's placed, allowing you to line it up just so before firing it off. Once activated, any team damage that passes through the Matrix is massively amplified. It stacks with Orisa and Ana's ultimates too, along with the damage boost that can be provided by Mercy. It can be a very powerful utility tool for taking objectives or finishing a teamfight. It's recommended that you place this forcefield very carefully, ensuring that as many of your team as possible can fire through it, into as many enemies as possible! Although it looks like a shield, keep in mind that the Amplification Matrix provides your team with zero defensive cover whatsoever. It exists purely to boost up the damage that passes through it and into the enemy team. As we've mentioned in the description, this boost does stack with other damage boosts, such as those provided by Ana or Mercy. Coordinate with your team to ensure you get the most out of this ultimate's exceptional potential. 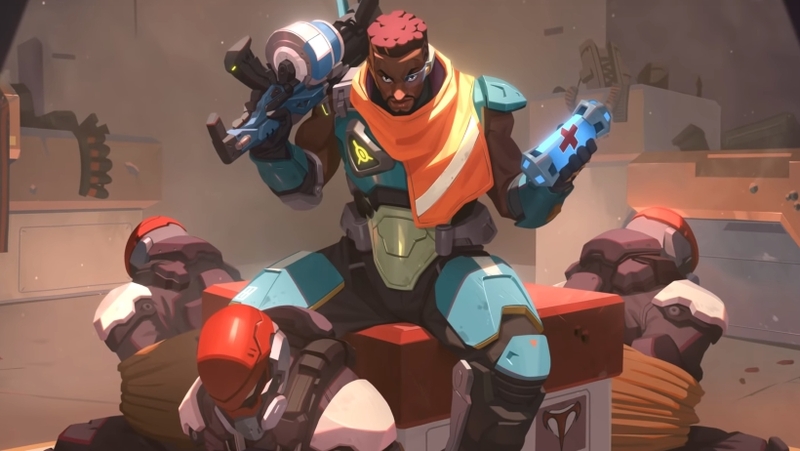 Baptiste is from Haiti, and became orphaned during the Ominic Crisis which precedes the events in the modern day Overwatch universe. 30 million children were orphaned as a result of the Crisis, and Baptiste was one of them. As he grew up, he came to join an outfit known as the Caribbean Coalition, and became a high-ranking combat medic. He battled alongside the group's special forces, and was a primary medic during this period. During his time with the team he learned the skills to become a great soldier and a great teammate. When the Omnic Crisis came to a close, Baptiste found himself looking for work and ended up in the Talon organisation. At the time of joining Talon, he didn't realise that they were the bad guys we know them as today. He joined reluctantly, fought with them for a time, but came to realise that they're ultimately bad people doing bad things. After coming to this realisation, Baptiste made the decision to split from Talon and go and fight for the greater good ie Overwatch.